Q: What are Lumineers/porcelain veneers and how can they improve my smile? Lumineers/porcelain veneers are very thin shells of tooth-shaped porcelain that are individually crafted to cover the fronts of teeth. They are very durable and will not stain, making them a very popular solution for those seeking to restore or enhance the beauty of their smile. Getting lumineers/veneers usually requires two visits. Lumineers/veneers are created from an impression (mold) of your teeth that is then sent to a professional dental laboratory where each lumineer/veneer is custom-made (for shape and color) for your individual smile. With little or no anesthesia, teeth are prepared by lightly buffing and shaping the front surface of the teeth to allow for the small thickness of lumineers/veneers. The lumineers/veneers are carefully fitted and bonded onto the tooth surface with special bonding cements and occasionally a specialized light may be used to harden and set the bond. Lumineers/veneers are an excellent dental treatment that can dramatically improve your teeth and give you a natural, beautiful smile. Q: What is Invisalign and how does it work? Invisalign are clear alternative to metal braces, By using a series of clear, removable aligners, Invisalign straightens your teeth with results you'll notice sooner than you think. The course of treatment involves changing aligners approximately every two weeks, moving your teeth into straighter position step by step, until you have a more beautiful smile. And unlike braces, these clear aligners can be removed while you eat and brush your teeth as usual. An average Invisalign course of treatment takes about a year. You'll see your Invisalign Certified Dentist every 6 to 8 weeks for adjustments and to check progress. At regular intervals, you'll receive a new set of custom-molded clear aligners to continue the straightening process. The total number of clear aligners is specific to you, determined by your doctor for your course of treatment. Lumineers/Porcelain Veneers: Lumineers/veneers are thin custom-made, tooth-colored shells that are bonded onto the fronts of teeth to create a beautiful individual smile. They can help restore or camouflage damaged, discolored, poorly shaped, or misaligned teeth. Unlike crowns, lumineers/ veneers require no/minimal tooth structure to be removed from the surface of the tooth. Orthodontics: Less visible and more effective brackets and wires are making straightening teeth with orthodontics much more appealing to adult patients. Invisalign: Also, in some cases, teeth may be straightened with custom-made, clear, removable aligners that require no braces. In office ZOOM Advanced Power teeth whitening: This treatment is done in the dental office and you will see results immediately. It require one visit, with 3x 15 mins. application lasting for 60 minutes. While your gums are protected, a bleaching solution is applied to the teeth. A special light may be used to enhance the action of the agent while the teeth are whitened. 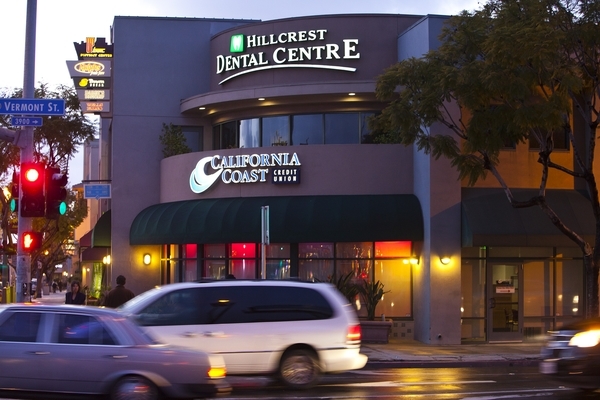 Q: What fee plans and insurances is Hillcrest Dental Centre in network with? Because your smile is important to us, we offer CareCredit, a healthcare credit card specifically designed to pay for treatments and procedures not covered by insurance. With convenient payment plans, a simple application process and instant decision, you can schedule your apointment today and pay it over time. We're preferred provider for Aetna, Ameritas, Anthem, Assurant, Blue Cross of CA, Blue Shield of CA, Cigna, Connection Dental, Delta Dental, GEHA, Guardian, Humana, Lincoln Financial, Metlife, Principal, Standard and United Health Care. We will bill all other insurances in addition to the above mentioned.